I know a lot of you are going to instantly notice the slanted bridge. When I first unwrapped the instrument I was dismayed to see it, but once I tuned it up... actually, the intonation is just fine. 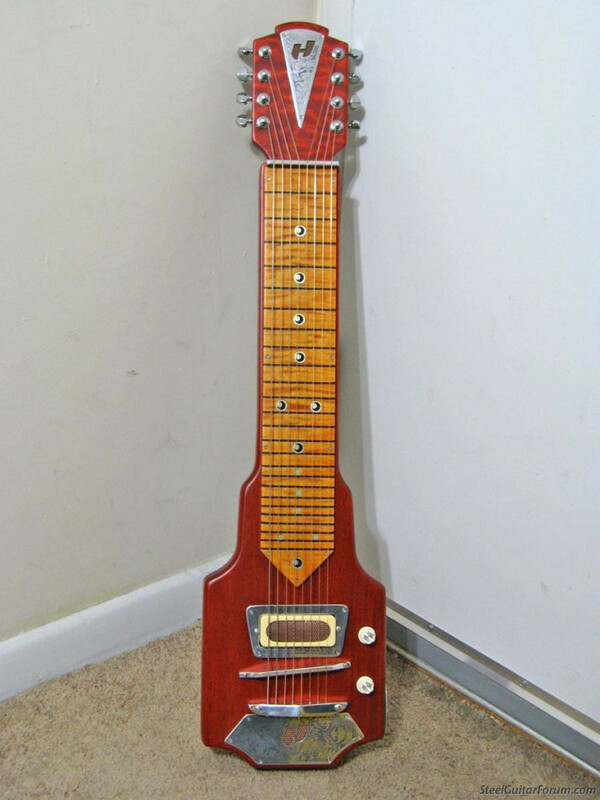 I've checked it up and down the fretboard, and it sounds best with the bar perfectly parallel to the frets. Perhaps I'm putting more pressure on the bass strings without realizing it. The body is made of two slabs of mahogany glued together; the seam is visible around the sides. 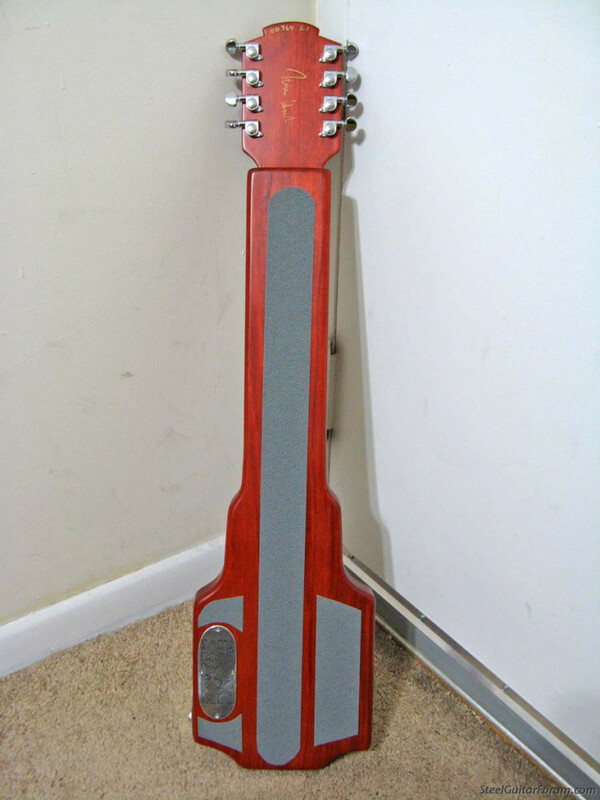 The headstock is a separate piece of mahogany with a maple veneer, and it's glued into a recess in the body under the fretboard. It's covered in a satin finish. 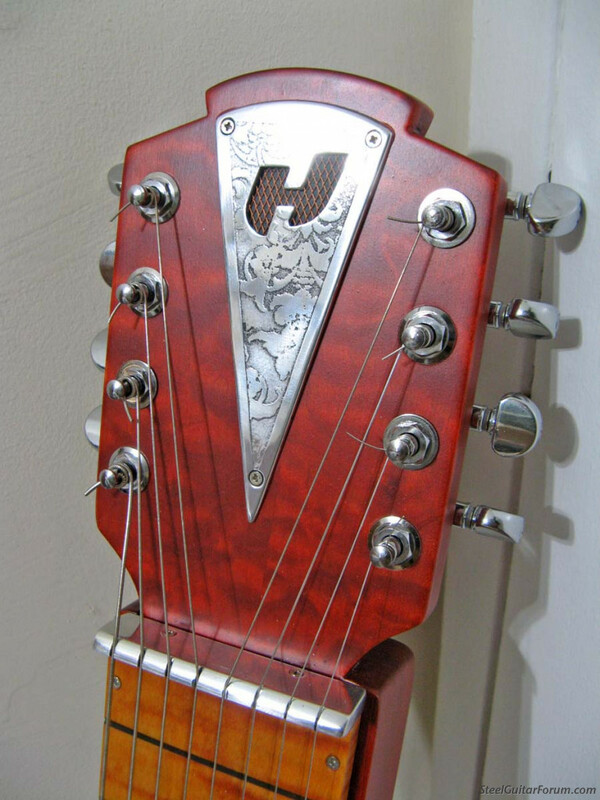 The nut and bridge are solid aluminum, as are all the stamped & etched plates that adorn various parts of the instrument (including the control cavity cover and the jack plate). There are non-slip pads on the back. The pickup is the same single-coil design used in may of Harden's guitars. It's the size of a P90, but it sounds more like the oval pickups used in late '40s Gibson steels: thick and creamy, with plenty of mids, smooth highs, and a touch of compression. It gains an exceptional bite through an overdriven amp though, and the output is moderate so it doesn't become muddy. The steel has very good sustain, especially considering its light weight. A banjo, like a pet monkey, seems like a good idea at first. That is a nice looking guitar Noah. I'm pretty new to this. Why do manufacturers skew the bridge? I notice that sometimes I'm likely to run sharp on the bass side strings (bar pressure issue?). That slanted bridge would likely help me. It's the norm in the guitar/mandolin/etc. world to have an angled or compensated bridge because different string gauges bend by different amounts when you fret them. 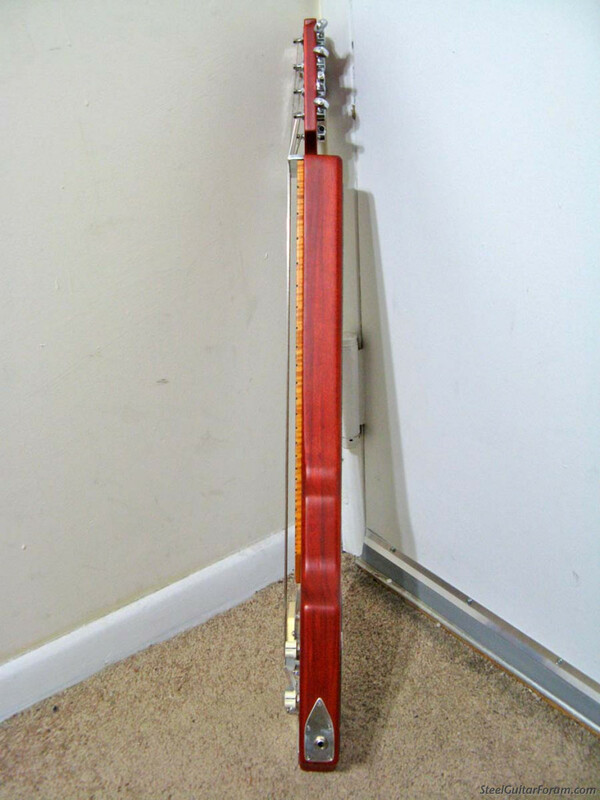 In order to play in tune up a guitar's fretboard, a the bass strings typically need to have a slightly longer scale than the treble strings. That's theoretically not an issue on steels, because the bar should be bending all the strings by the same amount. Guitar builders who occasionally venture into lap steels may be unaware of this difference. Unique, cool vibe but why the slanted bridge? Doesn't it make playing harmonics in a straight line impossible? I guess that was kind of my question. I thought nut to 12th, and 12th to bridge should be equal distance?? I would love for you to post a video or sound file of you playing this steel. I’ve thought about this builder making me a 6 string steel for blues playing and would really like to hear how his steels sound. Love the design. Some inspiring decorative etching there. 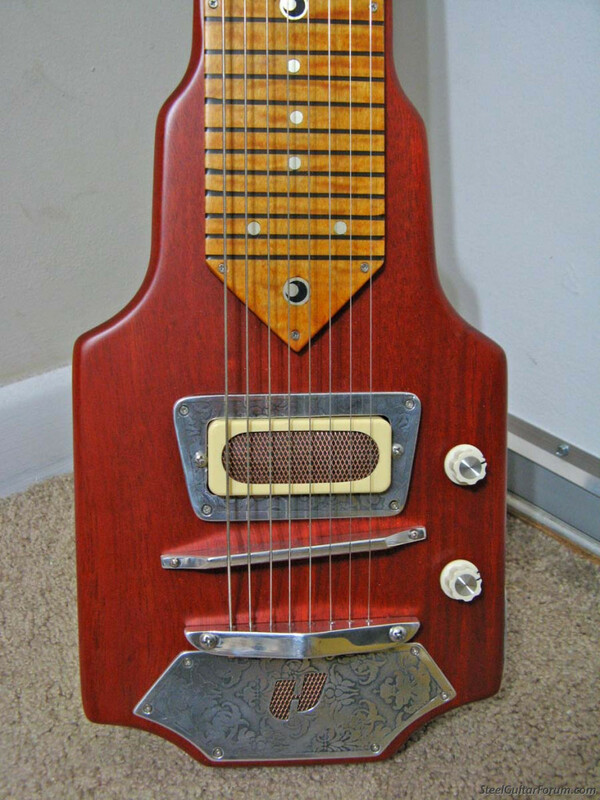 Nice looking guitar but, like a few others here, I'm not convinced by the slanted bridge. But if it works then it's all good. Thanks for the clip. Sounds good. It does look a bit wrong Per, now that you have pointed it out. That sounds nice and looks cool. If the bridge works, what's not to like?